The default font size for messages and texts on the iPhone is fairly small, and while it may look fine to many users, it’s simply too tiny to be easily readable for others. iOS makes it easy to change the text size though, offering a wide range of options that are suitable for just about everyones visual preferences. We’re emphasizing the iPhone here, but this setting and adjustment is also available to iPod touch and iPad users. The preview text alongside each option gives you a general idea of how things will look, but it’s really best to make a settings adjustment, then flip over to the Messages app and see how things look directly. 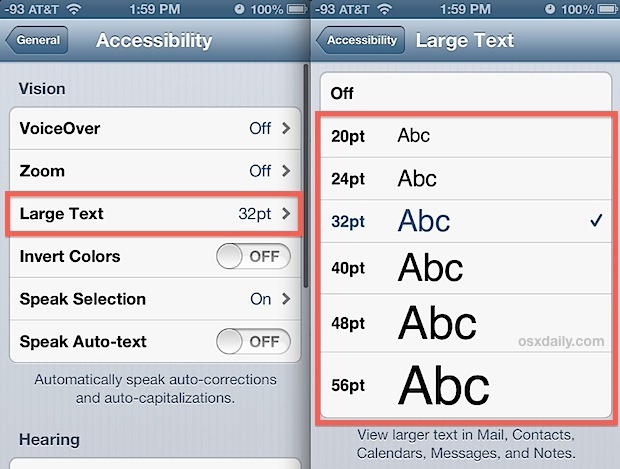 With both iOS 6 and iOS 7, increasing the font size setting here expands beyond Messages content, and it also boosts the text size in Mail app for email body and subjects, Calendars, Contacts, and Notes too. The result is a much more readable experience in places where it matters most, and if you ever find yourself squinting to read the small on screen words, just take a moment to increase the sizes here, it can make a big difference in usability. I have fairly decent eyesight and I find myself most comfortable with the 20pt font size setting on the iPhone, and for older folks and those with visual difficulties, I always opt for 24pt, 30pt, or higher. You will find that once you start approaching the 48pt and 56pt text sizes, on screen elements and reading gets very cramped on the iPhone and iPod touch screen, but the larger sizes look just fine on the iPad which just has more screen real estate to work with. By the way, if you also use Messages on the Mac too, you may wish to boost the text size there as well so that all messages are more legible, regardless of the platform you are reading them on. Thanks for the clear & (hopefully) helpful suggestions for enlarging the text size w\ o blowing the whole pg up off the screen! So is there a way like with the Galaxy to ONLY enlarge text messages with iPhone 7?